— Deborah Harmon-Pugh, National Campaign Chair of Women Veterans ROCK! 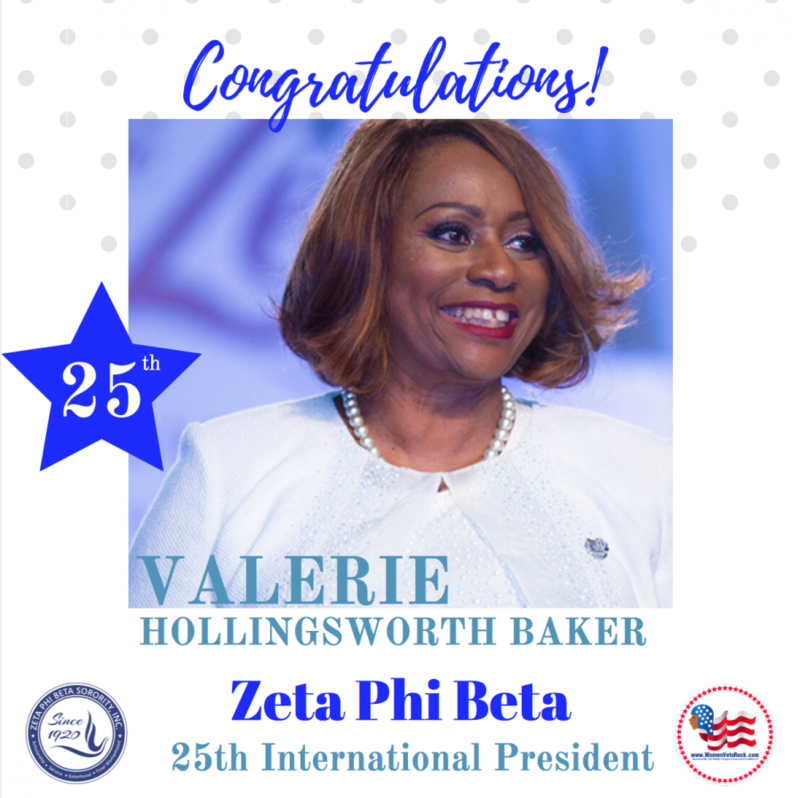 NEW, YORK, NEW, YORK, US, August 1, 2018 /EINPresswire.com/ -- Women Veterans ROCK!, a proud national enduring partner of Zeta Phi Beta Sorority, Incorporated is elated to congratulate and welcome the organization’s 25th International President, Valerie Hollingsworth-Baker. Zeta Phi Beta Sorority, Incorporated, a 98-year-old international women’s service organization became the first and only Greek Letter Organization to implement a national initiative committed to supporting America’s transitioning Women Veterans and Military Families. In 2014, they named Women Veterans ROCK! a national enduring partner. Valerie Hollingsworth-Baker, of the Greater New York City Region, has been supporting The Women Veterans ROCK Community as the National First Vice President of Zeta Phi Beta since 2014. As a national leadership liaison and strategic partner serving on behalf of the Sorority, she and Battalion Commander Natasha S. Clarke, the National Military Attache’ – nurtures an enduring strategic alliance that has directly strengthen the very core of The Women Veterans ROCK Civic Leadership Institute. Under the generous national leadership of Dr. Mary Breaux Wright, the Women Veterans ROCK civic leadership initiative has built a strong foundation and a bright future as it marches toward its 10th anniversary in 2020. Dr. Mary Breaux Wright, of Houston, Texas, precedes Hollingsworth-Baker as the 24th International President, and she also served as the visionary behind the collaboration with Women Veterans ROCK. Her deep and genuine passion for America’s Military Women and Military Families serve as the bedrock of her unwavering support for Women Veterans ROCK. She has led many robust nationwide drives that stimulated generous support for America’s Women and Girls in Military Families for three consecutive years. Women Veterans ROCK is building a legacy of civic leadership and civic engagement for today’s Military Women and ROTC Cadet Girls. Thanks to an early vote-of-confidence from Zeta Phi Beta Sorority, Incorporated, The Women Veterans Civic Leadership Institute is now recognized as the leading civic engagement incubator in the Mid-Atlantic Region for today’s Women Veterans; Active Duty Service Women; Reservists; National Guard; ROTC; Military Spouses; and Military Moms too. The Women Veterans Civic Leadership Institute, (WVCLI), a one-year civic leadership fellowship program. “Our Priority Is Preparing Women and Girls in Military Families for Public Leadership. We are excited to continue building our legacy of leadership with the Zeta Phi Beta Sisterhood under the leadership of its 25th International President, Valerie Hollingsworth-Baker. Welcome Aboard!,” says Deborah Harmon-Pugh, President of The Healthy Caregiver Community Foundation and National Campaign Chair of Women Veterans ROCK!